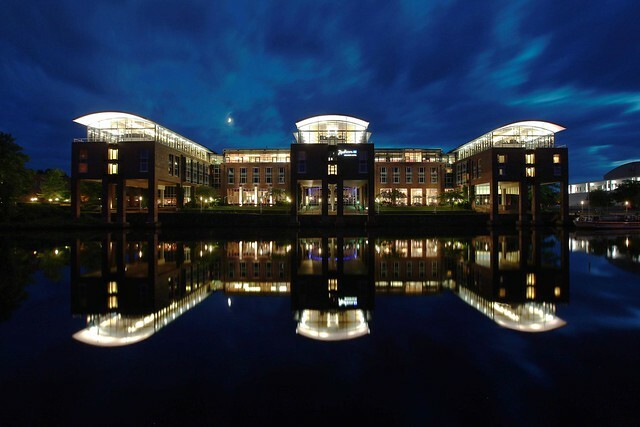 Making a nightscape capture of Radisson Blu Senator hotel in Lübeck is by far the most satisfying thing that I have done for the night. 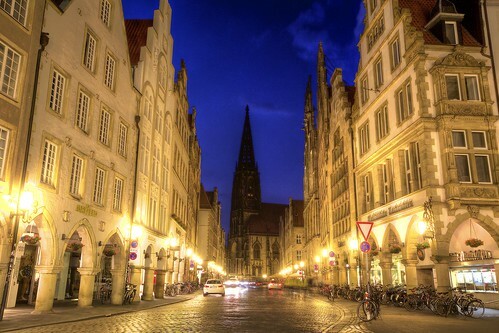 As the night fall comes in slowly into the lovely town of Lübeck, the darkness were filled with gorgeous lights from all the buildings around. The most prominent one from the river is the Radisson Blu Senator Hotel, from far, I can see the beautifully lighted hotel falling its back on the dark sky and reflecting its beauty on the still water. I can’t resist but grab as much compositions as I can as this is one hotel that I would love to stay in if I visit Lübeck again! I was very lucky to have the moon in the right position and not blocked by the moving clouds in one of my shots which I have shown below. It took me quite a while before I can get the symmetrical composition that I want from this hotel. I have used photoshop to balance the exposure just by a little and I don’t see the need to adjust anything else as this is a prized possession that Lübeck has given me as a very beautiful and memorable present. To me, I love the movements of the clouds with the moon as a companion that can give a little light to the sky as the background which compliments the stillness of the water with the hotel proudly standing as the main subject. 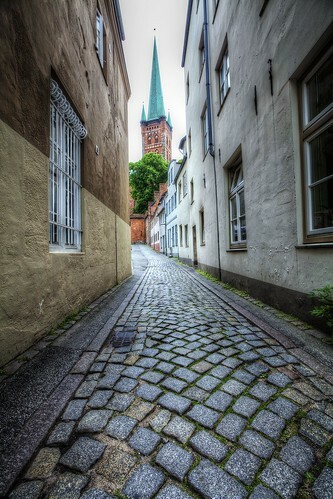 While doing a little shopping around the streets in Lübeck, we came across this beautiful view of St. Jakobi. It was still pretty early as the street was quite crowded with people so I have decided to come back to grab a picture from here after it starts to get dark. There are still quite a few people strolling in the city even though it was at around 10:30pm. Well, I must say that Lübeck is a very nice town to visit even though its at night as all the lights were turned on and beautify the buildings! I was doing long exposure shots and that is why I’m not worried about capturing people into my frame. After several attempts of long exposed shots, I prefer this picture over the other in terms of composition. I made this picture from a single RAW file and separated them into 5 different exposures before merging them into HDR. The Holsten Gate which is also known as Holstein Tor then later Holstentor, is a city gate that marks off the western boundary of Hanseatic city in Lübeck. 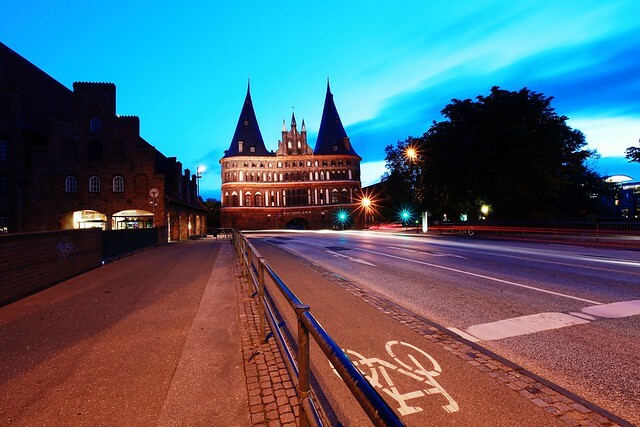 The two round towers and arched entrance are so well known that it is regarded as a symbol of Lübeck city. While searching for a nice city for a short trip, I must say that the picture of this two round towers captivated me and I was very excited to explore this beautiful city in search for photography opportunities! It was in the summer and tourists were visiting this gorgeous city, as expected, I’m not able to grab a nice clean shot of the Holsten Gate in the day. Therefore, I waited for sunset which was around 10:30pm. By that time, it was getting a little chilly and most of the weary tourists had already retired to their hotels and called it a day but I did not! With an ISO speed of 50, I took this shot with 16-35mm f2.8L II on 5D II using f14 and 30 seconds exposure. I was very contented with this shot as the way that this shot was framed. I was also glad that the sky was not totally dark yet and I could catch the movement of the clouds! This picture was only enhanced with saturation using photoshop and nothing else was done. We were enjoying ourselves so much in Lübeck as this town offers so much photography opportunities as well as gorgeous churches to behold which are totally different from the usual ones we visited in Germany! 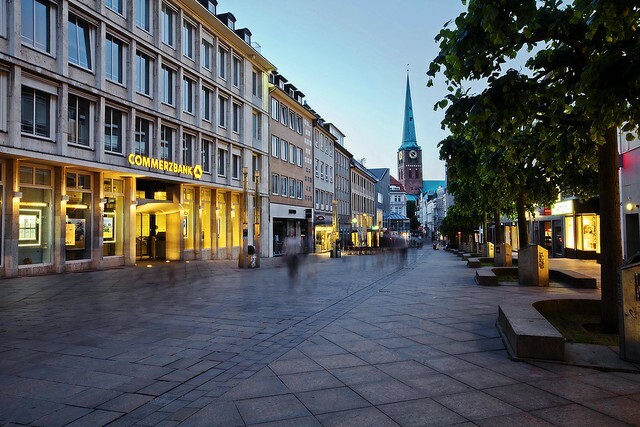 Lübeck is a small town where you can explore the place by foot. With so many beautiful churches around, you will not lack of anything fascinating to treat your sights to and with the river that goes round the town, you can behold yourself the serenity of the town and enjoy people watching. We were strolling along the river when I spotted St. Peter’s Church or we also call it St. Petri right down the alley which gave me an opportunity to explore a different perspective and different way to compose my shot. With the stones that pathed the road and the uniform buildings at both sides, they helped by leading the spectators’ view to the main subject. I made this shot from a single RAW file which I extracted 5 different exposures, from there, I merged them into HDR using photomatix. In my own opinion, I love this picture for its outstanding color which stands out from the dull colors of the buildings. I find this church so captivating from my point of view through this alley. 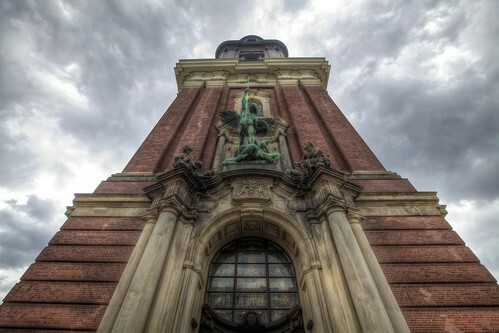 The St. Peter’s Church in Lübeck is now used for events for both cultural and religious and also art exhibitions as there are no services held in it because of the unrestored interior since World War II, however, the exterior were completely restored in 1987. I had such wonderful experiences on top in the tower having the great breathtaking view of the Hamburg city that I intended to look for a nice angle of this building to grab some shots of it. As there are too many distraction subjects that I can’t get a clean shot of this church, I also made my way further away from the church to get a shot far enough to put those foreground distractions into minimal. Here, I like it how the clock shines against the dark color of the tower. That clock really stands out and I really do appreciate it there as I had great photography opportunities with it! In this post, all the pictures are made from HDR. Taken with a single RAW shot and made 5 different exposures out of it and then merged them using photomatix. The church was in fact full of visitors on a typical Saturday which is common in Hamburg as it is a big city, so it is almost impossible for me to get a clean shot of the front view of the church. Therefore, I decided to take framing from another perspective by simply looking up from below! I also made this picture into HDR to make it dramatic looking! And I must say I was lucky enough to get such nice sky as my background! Having a great summer in northern part of Germany is one great thing, getting up to the tower and have a nice view of the whole city and the harbor is another! 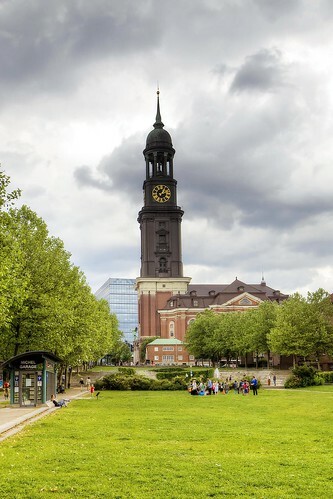 We were on our way to the harbor in Hamburg and saw this beautiful tower from far and was excited to visit the tower. It was €5 for an adult visit to the tower and it was fairly crowded on a Saturday. We took the easiest option to join the queue which took us less than half an hour for our turn and took the elevator up to the top. It was a great day and of course, I must say that I enjoyed the magnificent view from the tower down to the beautiful landscape across to the harbor. With this panorama view from the tower, panoramic shots came to my mind instantly and I looked for spots that I can take a nice series of shots to make them into panorama pictures. It was not difficult to get the right locations as people there are kind enough to give me space that I want. Besides being a shopping paradise for me, Hamburg also has a beautiful harbor that you can visit and seat yourself in one of the nice restaurants along the water. Taken with 13 pictures which divided them into upper row and lower row, these panoramic pictures were then stitched up using photoshop and enhanced using the HDR toning. All shots were taken with 16-35mm f2.8L on 5D II, but to note that pictures do not always stitch well when taken at 16mm, I took all shots at around 24mm so as not to have any distortion which might cause a problem in stitching the pictures in photoshop.